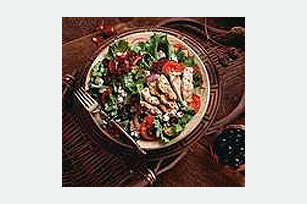 Put a Mediterranean-style twist on a classic with this delicious Greek Chicken Salad. Gather some plum tomatoes and cucumbers, and let's get started. Mix dressing and oregano. Remove 3 Tbsp. of the dressing mixture; place in large skillet. Add chicken; cook and stir on medium heat 10 minutes or until chicken is cooked through. Toss greens with cheese, tomatoes, vegetables and olives in large bowl. Add remaining dressing mixture; mix lightly. Place greens mixture on serving platter; top with warm chicken mixture. Cutting raw boneless chicken breasts into pieces is a slippery task. Make it safer and prevent the knife from slipping by cutting the chicken while it is partially frozen.